The first official week of fall was SO HOT this year! We had record highs 5 or 6 days in a row, it was the hottest week of the whole summer, and it wasn't even summer. Kind of ridiculous. It's usually in the low to mid 70s, and we got up to 95 degrees! I'm not complaining. I know it will be cold before I know it, so I tried to enjoy the heat while I could. 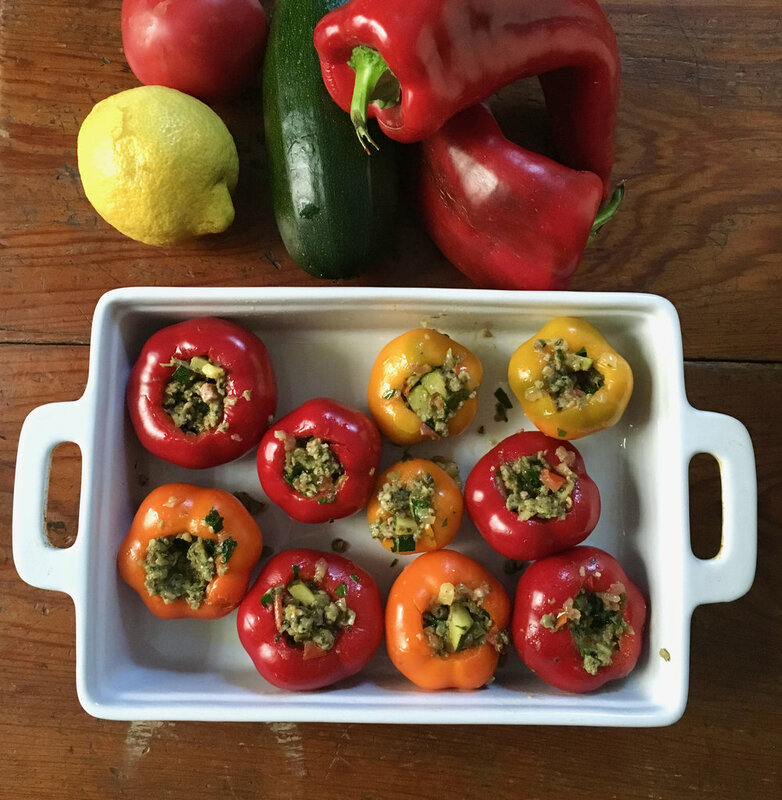 I decided to enjoy these unseasonable days with a summery stuffed pepper dish full of delicious sausage, in season veggies, and lots of herbs. Enjoyed on the front porch with a glass of Prosecco, it was spot on. And I ended the night with ice cream, obviously! A recipe in one of the cookbooks I recently checked out of the library inspired this dish. I didn't follow the recipe all that closely, but used it as a guide. The original recipe called for chorizo, but my butcher was out, so I went with their verde sausage which is one of my favorites. I don't know exactly what's in it, but it has herbs and a little heat, and is absolutely delicious. It worked out perfectly and these little stuffed peppers were perfect. I will definitely make these little guys again. And really, and sausage would be delicious, chorizo, verde, Italian, choose your own adventure. Preheat oven to 400 degrees. Oil a medium baking dish. Cut the tops off the sweet peppers. With a small knife, dig out the seeds and place the now prepped peppers in the baking dish (slice off a thin slice on the bottom of any of the peppers that want to fall over to create a flat surface). Preheat a large skillet over medium heat. Once warm, add a couple of tablespoons olive oil and the add the onions along with a little salt. Cook for 8-10 minutes until softened and starting to brown. Add the jalapeno (if using) and garlic and let cook for 1-2 minutes until the garlic is fragrant. Add the anchovies or anchovy paste, zucchini, chopped tomatoes and kale (if using; I had a little hanging out in my garden and so just threw it in, but it's not needed). If the skillet is looking too dry, add a little bit of water. Let cook for a couple of minutes until everything is getting nice and wilty. Add more salt to taste. Remove the casing from the sausages and crumble into the pan with the onion and zucchini mixture. Cook until the sausage is just about cooked through. Remove from heat and add the minced parsley and stir everything together. (At this point you can add a little bit of shreded of diced cheese; I had a small piece of Manchego floating around the fridge that was perfect for this, but you can just skip it too). Use a teaspoon to stuff the mixture into the prepared sweet peppers. Place in preheated oven and bake for 25-30 minutes, until the peppers are fully softened. Remove from oven and top with shredded parmesan cheese if desired. Let cool. Serve warm or at room temperature.